Most items on your PlanIT calendar are projects – these are the blog posts, email newsletters, events, and other ideas you are more or less committed to and that are fairly fleshed out. But what about those fleeting ideas? You know, the ones that are just a thread of something that you want to explore later, but don’t want to lose. The ones you usually put on a sticky note (and that usually get buried or stuck to the bottom of someone’s shoe). Those ideas, my friend, are exactly why we created the Idea Bank. 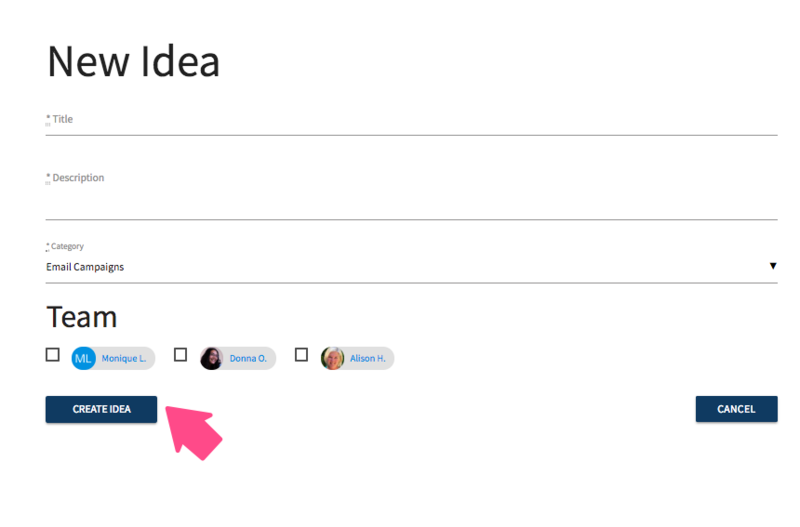 Capture these thoughts quickly and store them in the Idea Bank on your PlanIT. When you’re ready to assign them to a date, simply drag them into the appropriate spot on your PlanIT. Click on the red button in the lower right hand of your PlanIT and select Add Idea. Complete the sections listed on the screen, including Title, Description, and Category. Add a team member if you choose, and click Create Idea. When ready, simply drag the idea from the Idea Bank onto the PlanIT. Click on the pencil if you want to add more detail, such as a link to a web page, and edit.